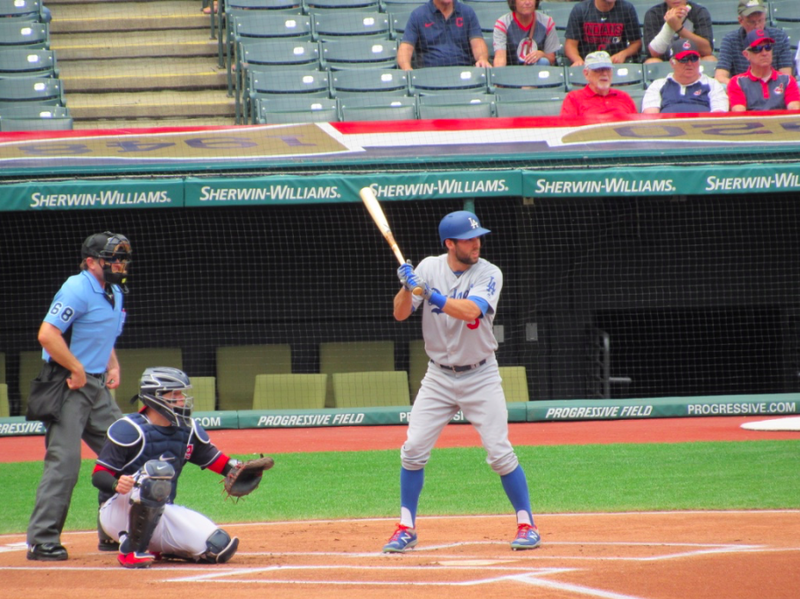 For the second time in a week; in a second city (and not Cincinnati), I saw the Los Angeles Dodgers play. 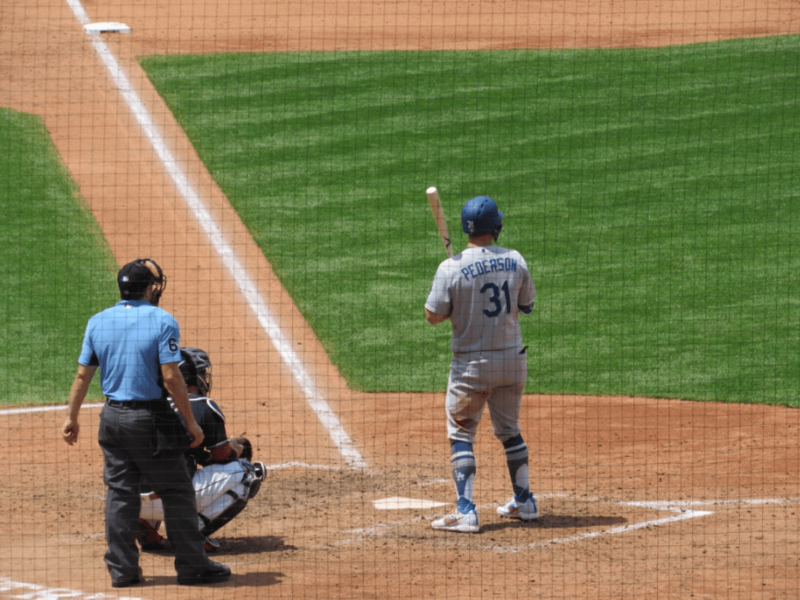 This loss, and the game was good for just a short amount of time; snapped the Dodgers six-game win streak. 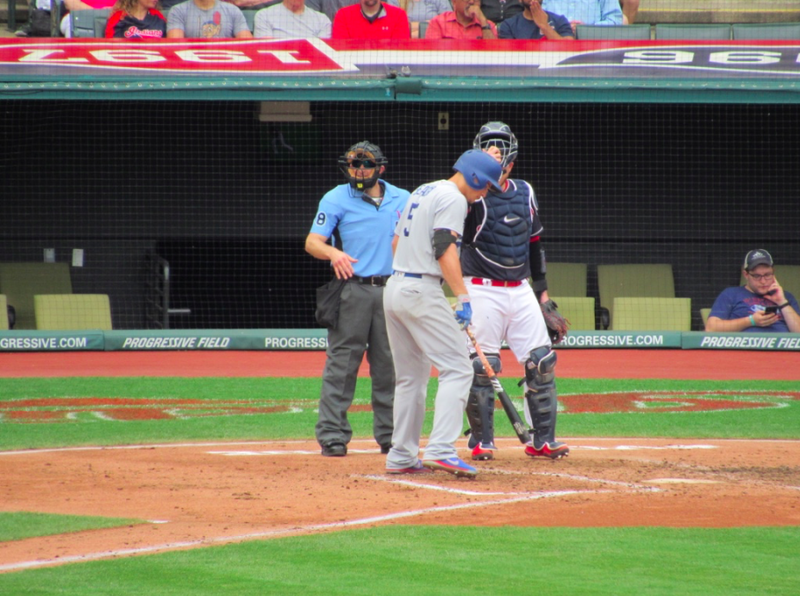 Among the things I saw yesterday on a humid 74 degree in Cleveland was: a Bradley Zimmer infield hit, an Edwin Encarnacion home run (he was on base five times), a Corey Seager Knock, Rich Hill was bad again early like last week when I saw him in Los Angeles, a Chris Taylor home run, ANOTHER Cody Bellinger home run, and a lot more I’ll cover below. 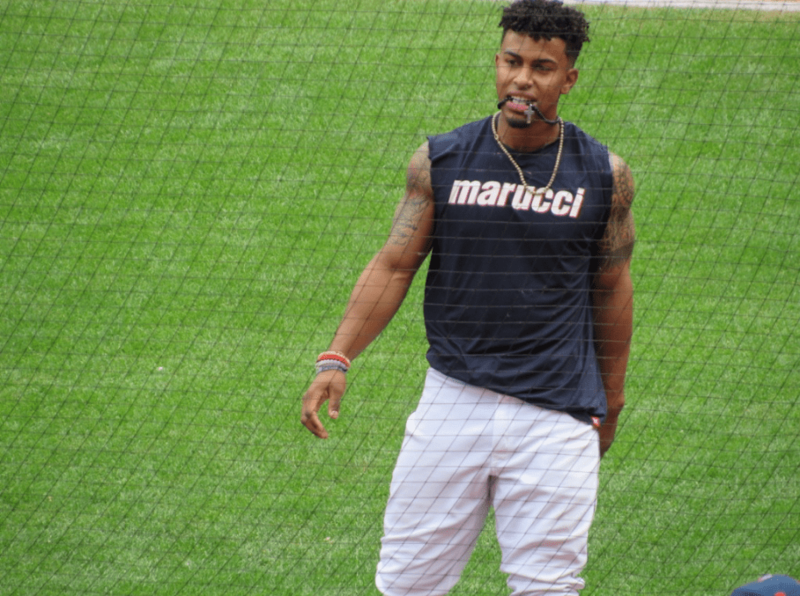 Francisco Lindor getting loose before the game with a medicine ball. Here’s where we choose to eat our lunch. 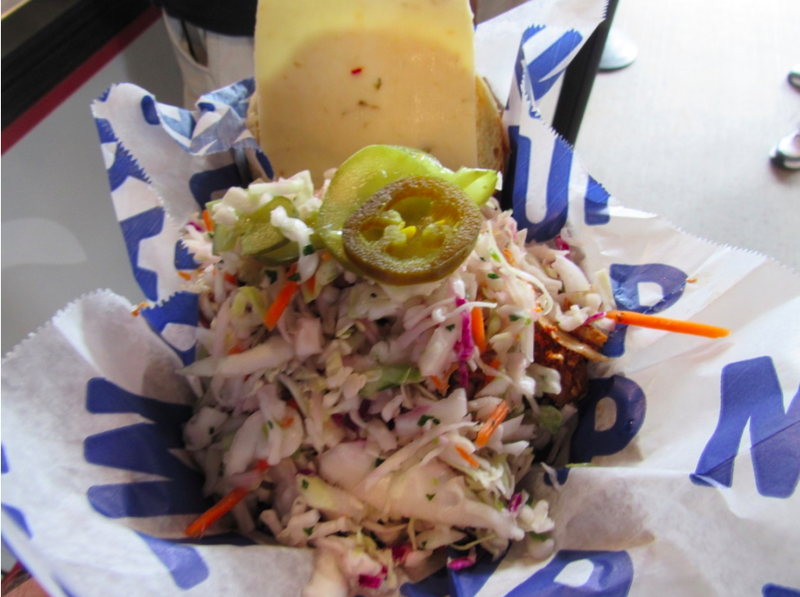 Here’s a picture of my smoked chicken sandwich. I ate about as healthy as I could at the park this day. You’ll notice, I didn’t get any BBQ sauce. My guy! Logan Forsythe. Man he is really struggling. He struck out three times on this day and looked rough at the plate. Corey Seager getting in some warmup tosses with Logan Forsythe before the game. It’s fun just to watch these guys warm up. 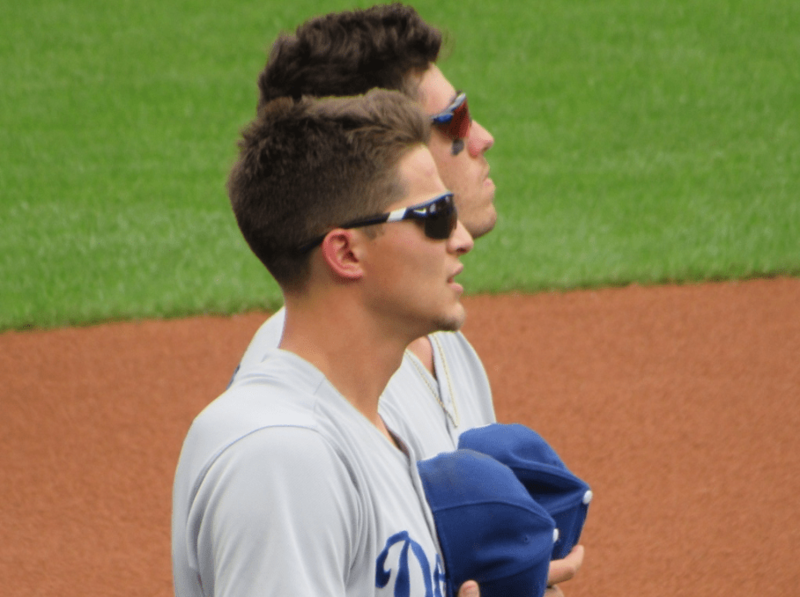 The future of the Dodgers, side-by-side for the national anthem: Corey Seager and Cody Bellinger. 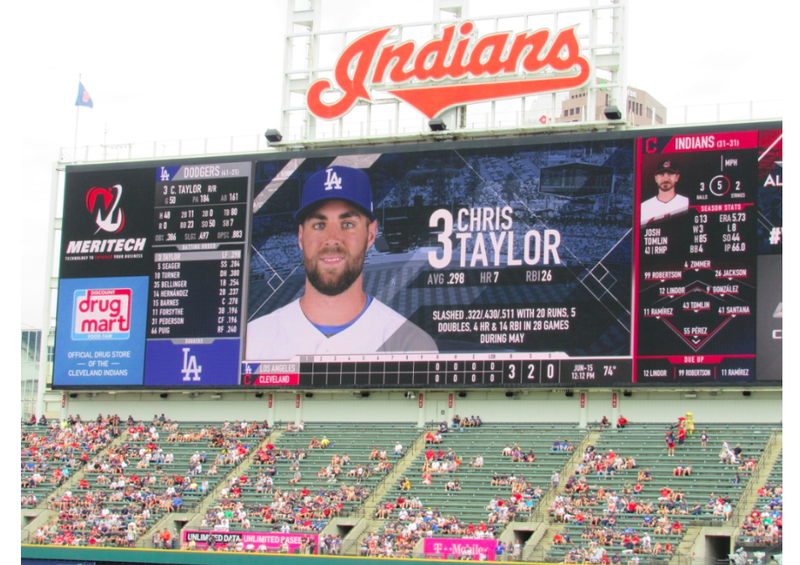 I’ve said it a few times, and I’ll say it again; Chris Taylor, ballplayer. 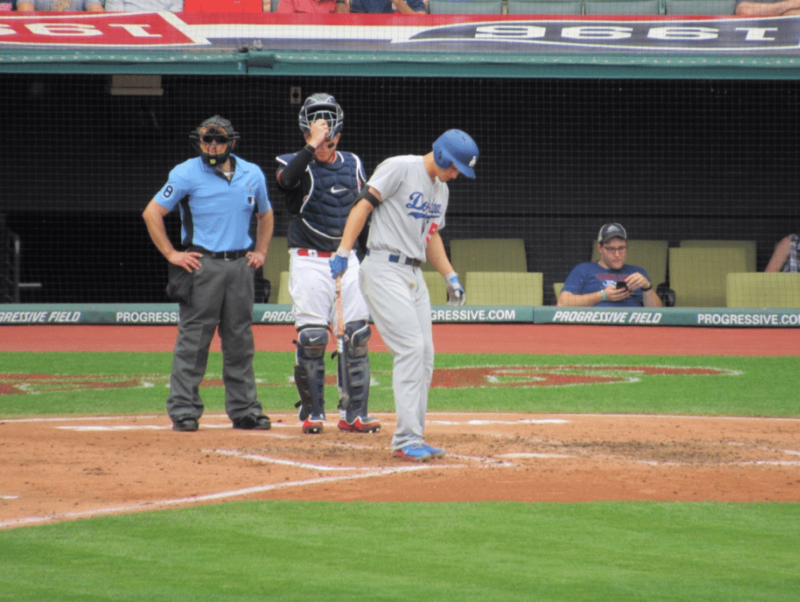 He homered and was on base a couple more times out of the lead-off spot for the Dodgers on this Thursday afternoon. A look at the largest free-standing scoreboard in professional sports. 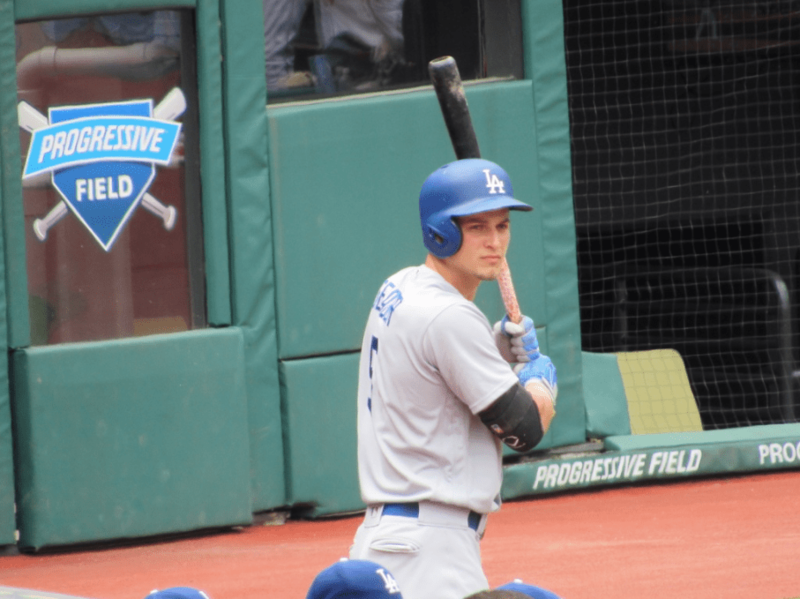 Corey Seager in the on-deck circle. 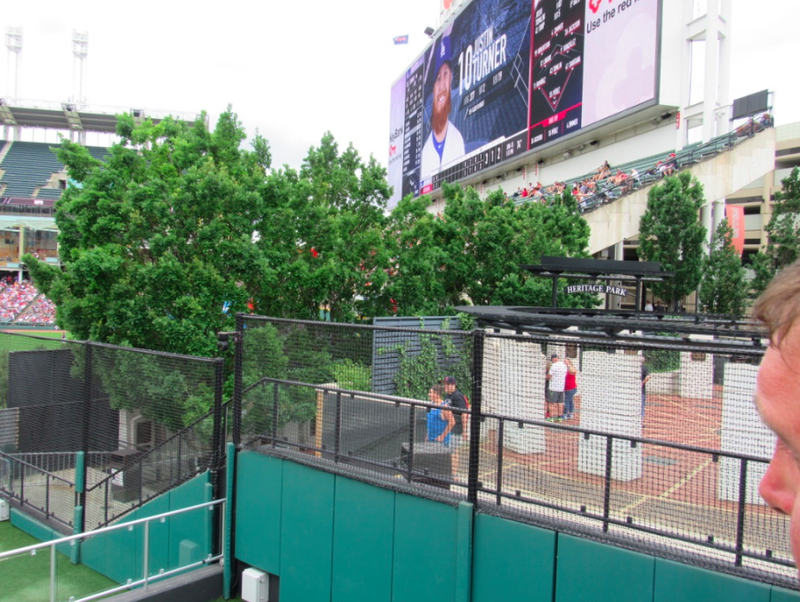 Josh Tomlin had decent stuff other than the balls that left the yard. Actually we saw him walk two hitters which is rare; but he struck out seven in five innings. 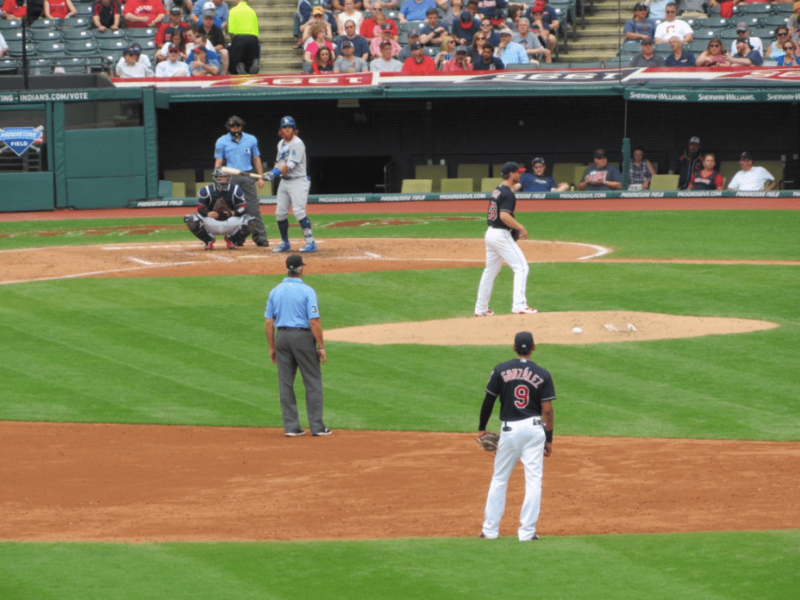 This was the first time I got to see Bradley Zimmer play live. He plays a smooth centerfield. 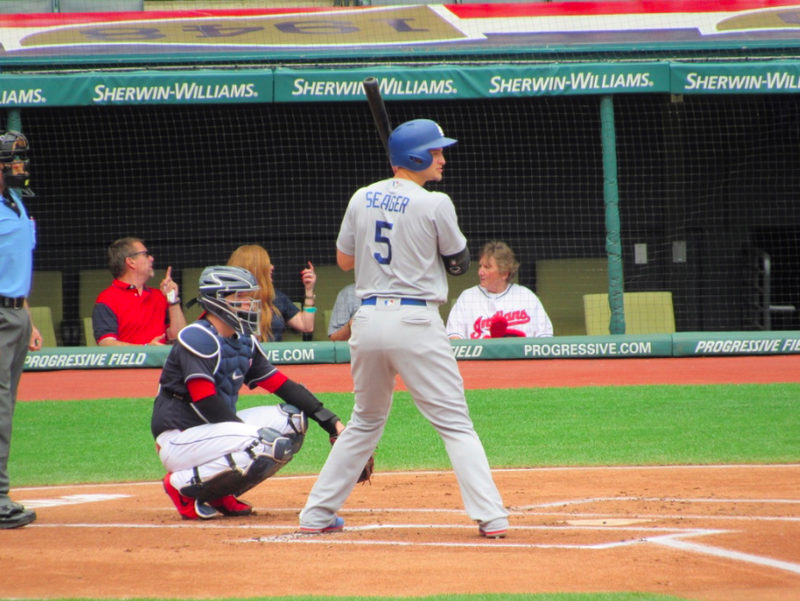 Corey Seager, doing that thing he does before he gets ready to hit. Seager digging in for AB number one. He struck out looking here. Maybe qualifies for shot of the day. 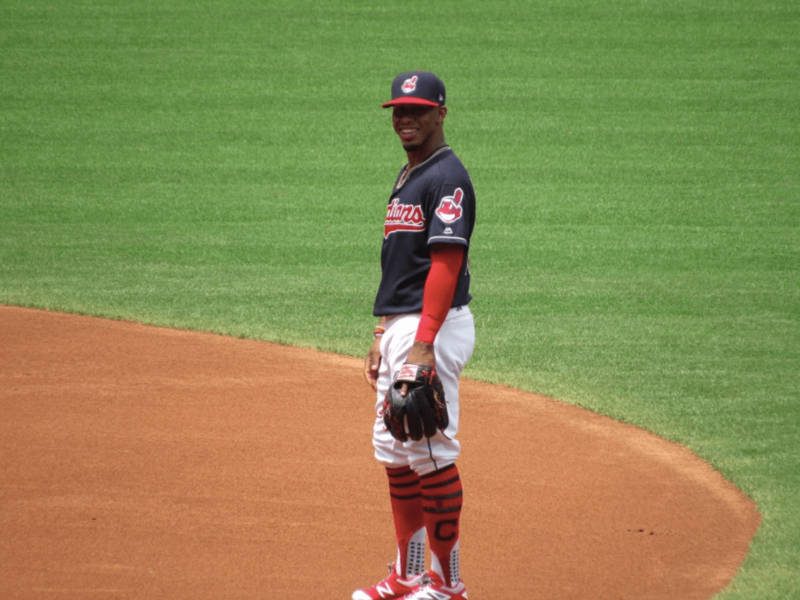 Francisco Lindor (1 for 5 on the day) looking right at me. 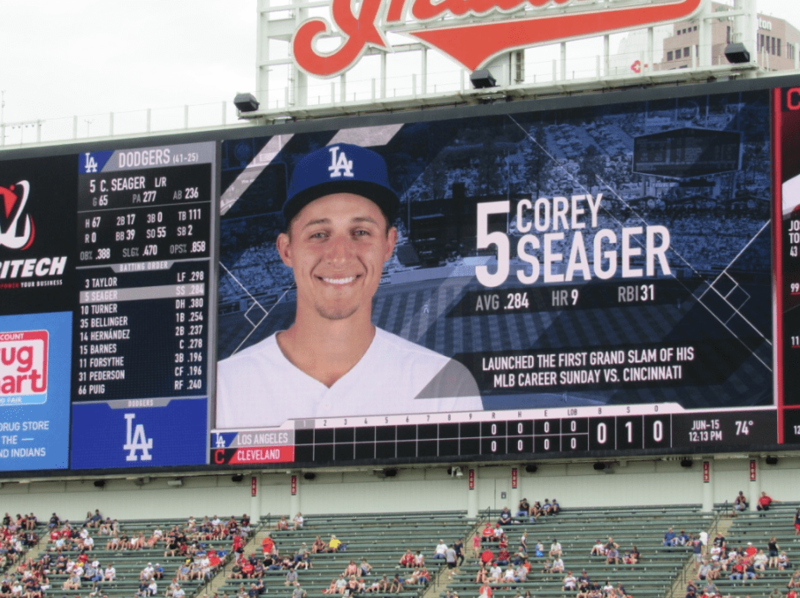 Seager’s scoreboard shot talking about his first career grand slam this past Sunday. 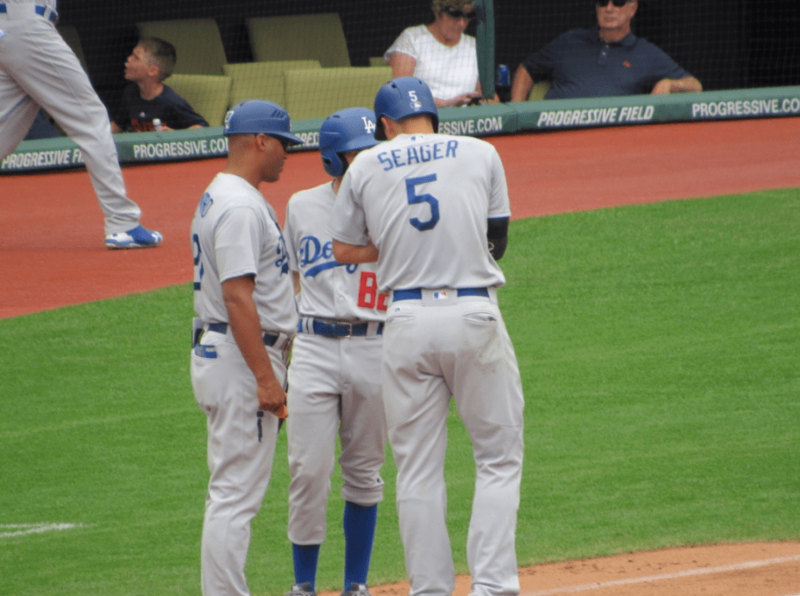 Corey Seager in the bottom of the first with his throwing hand fingers taped up. Rich Hill had another really shaky outing. I’m wondering when old Rich Hill is going to come back. Four innings, eight hits, seven earned runs, two walks, four strikeouts. 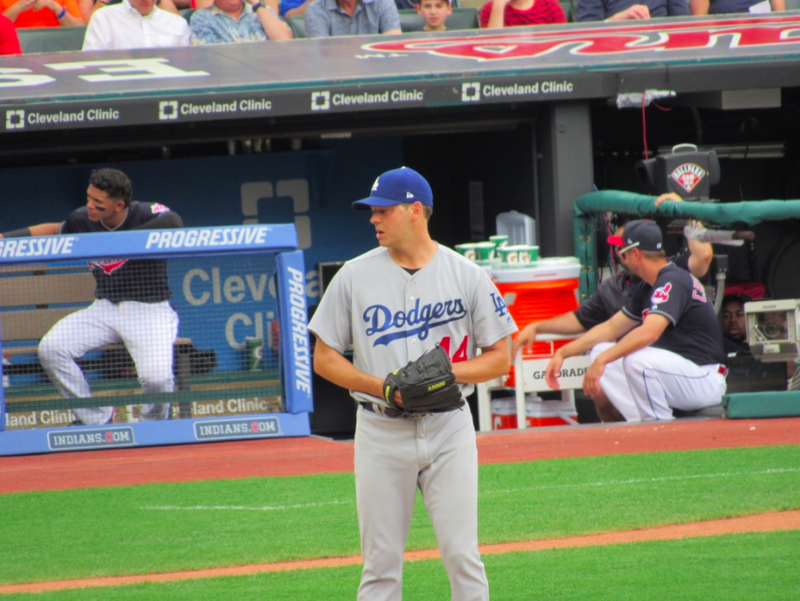 Just was a bad day for Rich Hill. 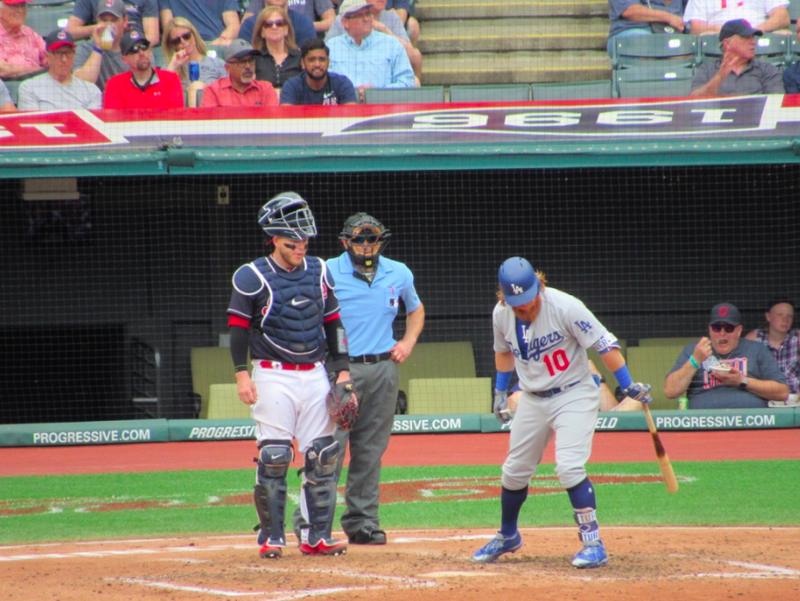 Here’s Edwin Encarnacion with a knock. He hit a bomb, and was on base five times on the day. 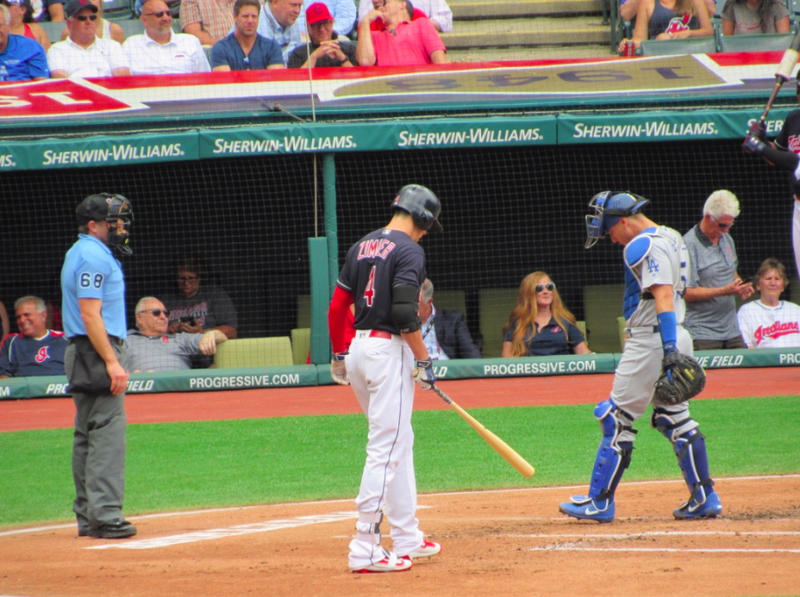 Bradley Zimmer went 1 for 3 with an RBI. He got an infield hit here because Rich Hill got over to the bag late. 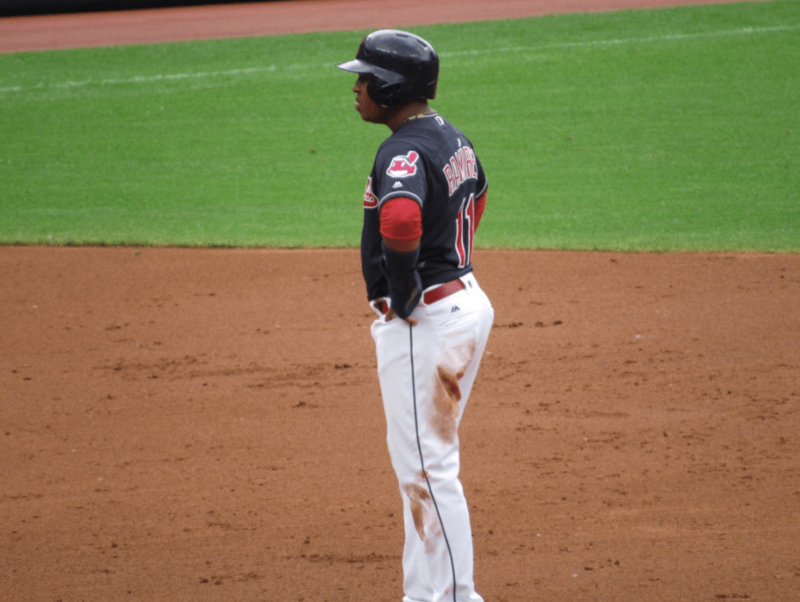 Jose Ramirez is a good little player. He was on base early and scored. 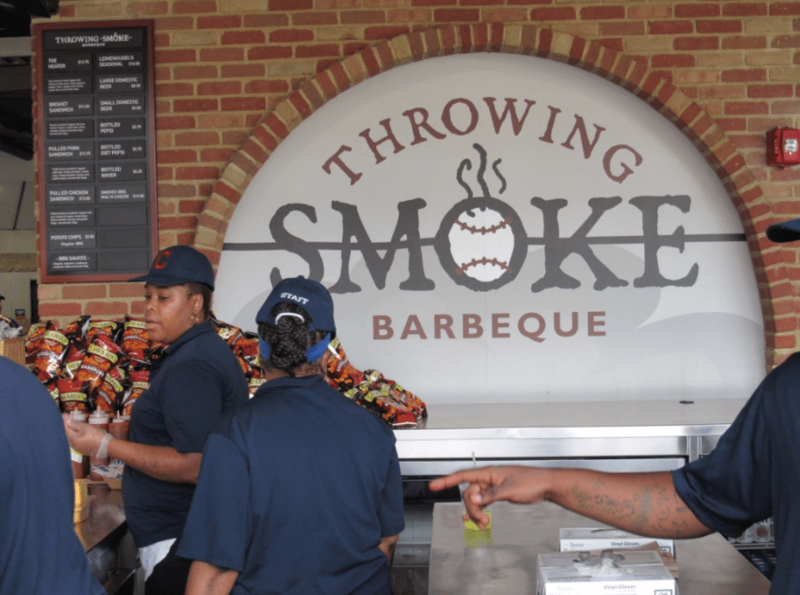 Three hits out of the three hole for Jose Ramirez. 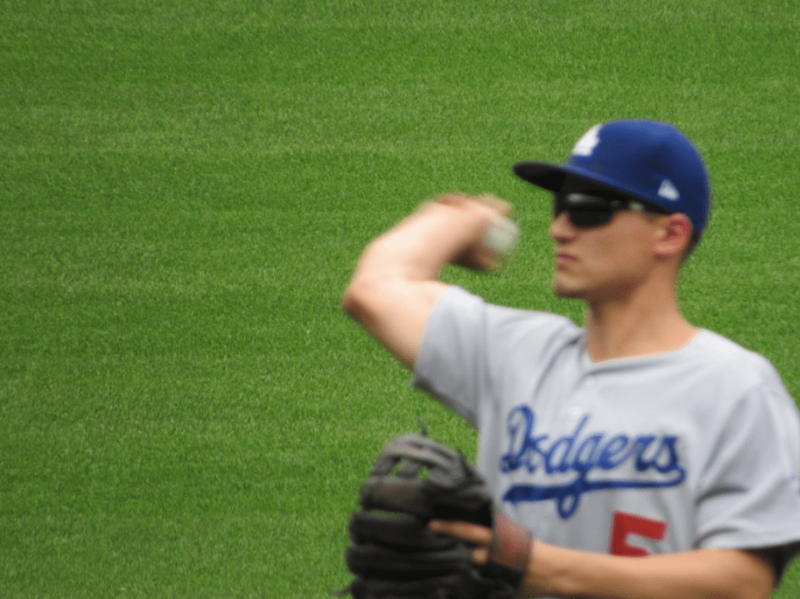 Here’s Seager digging in when we were standing in center field. 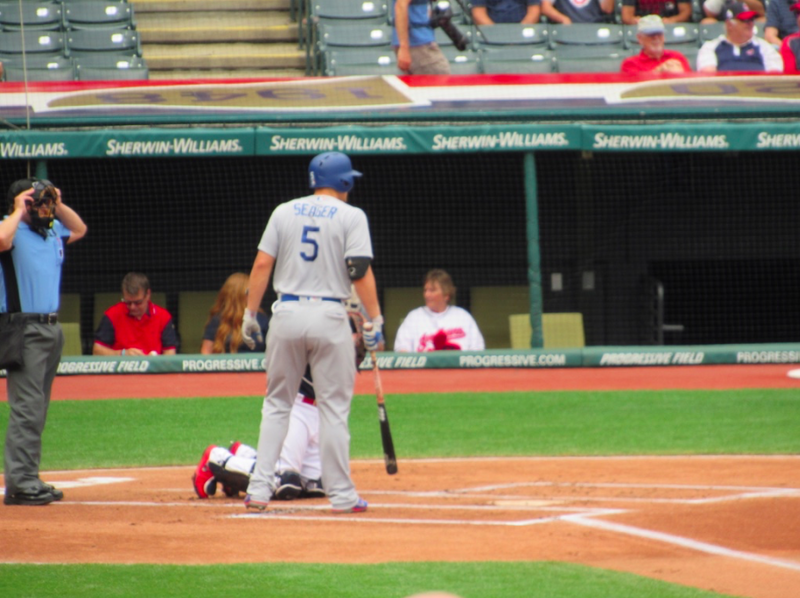 This was the fourth game I’ve seen Corey Seager play live. 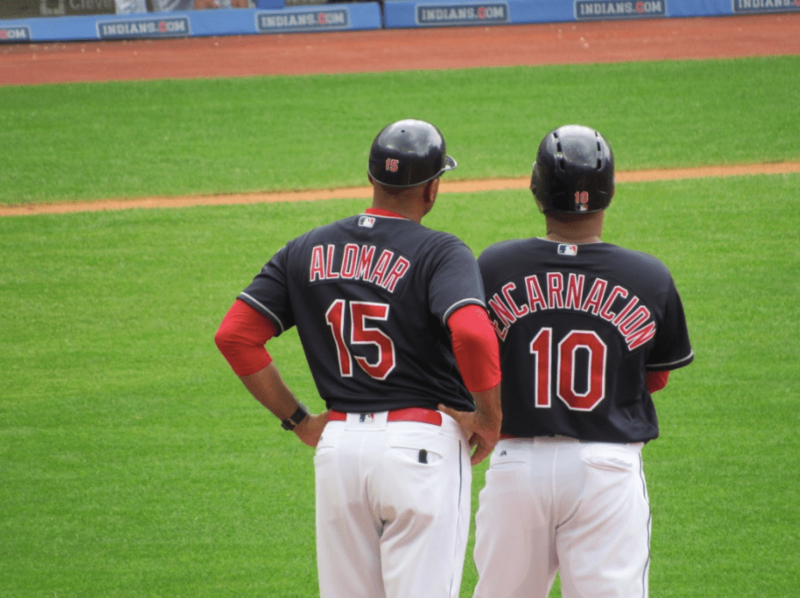 He’s about to get a hit off Josh Tomlin. 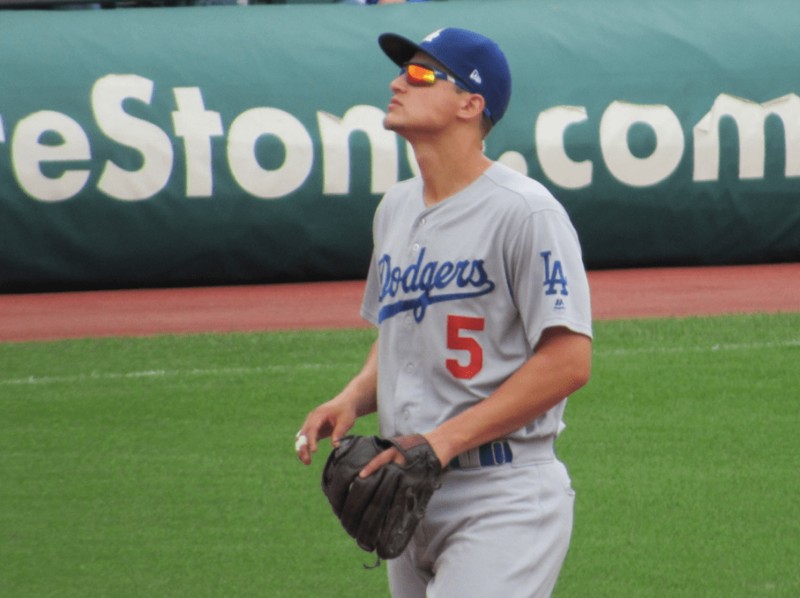 Corey Seager on first base after career hit number 294. Justin Turner went 1 for 4 on the day. When the game was over he was sitting at .377 on the year. He’s still limping around a little bit and he was the DH on this day. 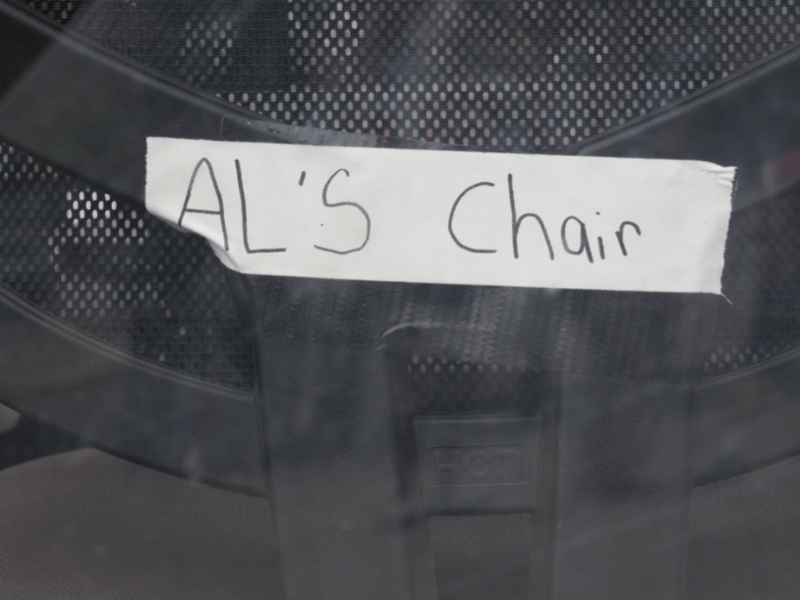 This is Vampire Al Polowski’s chair in centerfield at the Sportstime Ohio Sports Desk. 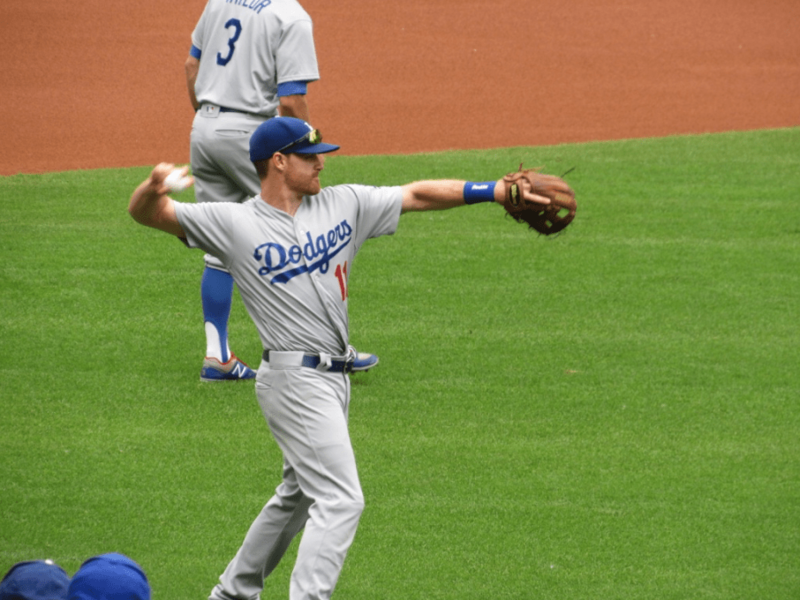 Justin Turner digging in from our centerfield view. 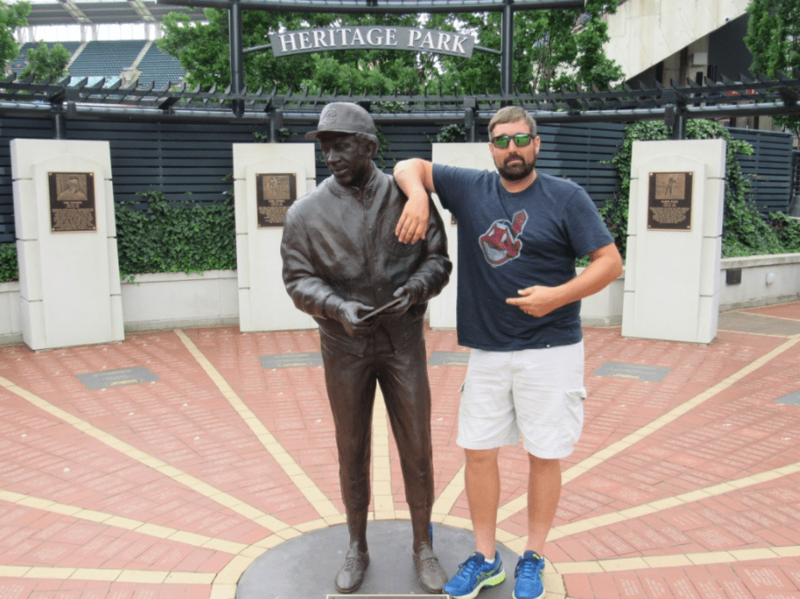 My buddy at the Indians Heritage Park with Frank Robinson. 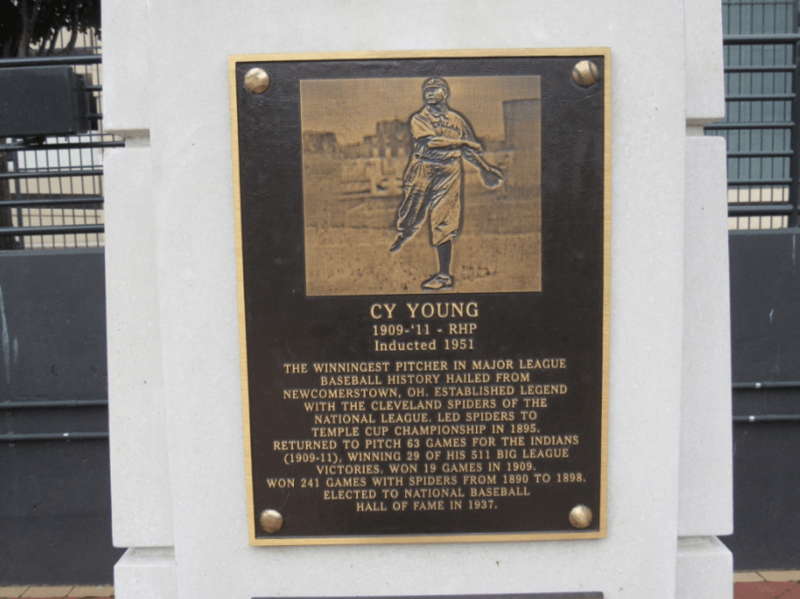 My buddy the Indians fan did not know Cy Young was an Indian for two years. Here’s proof. 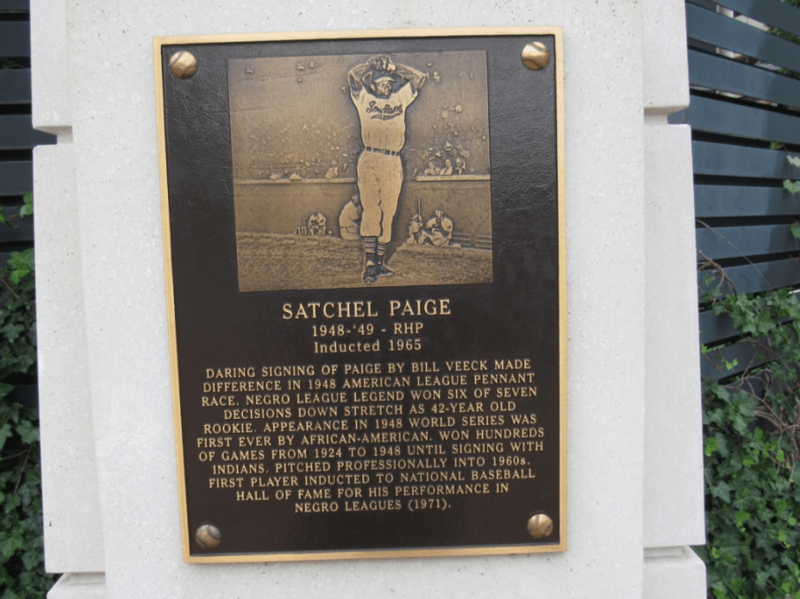 And I also pointed out that the greatest black pitcher ever; Satchell Paige was an Indian for a couple of years too. 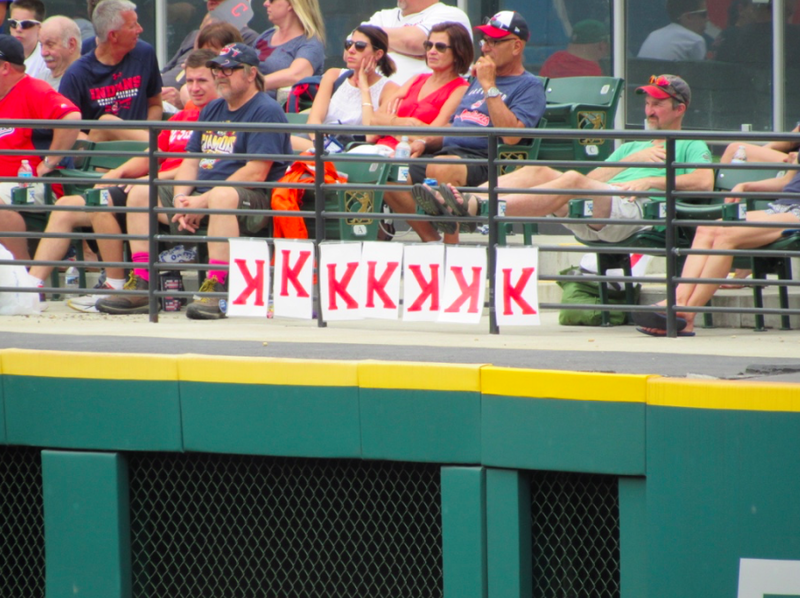 Here’s all of Josh Tomlin’s strikeouts recorded. I like when this is done somewhere in the park . The last shot of the day is for some reason; struggling Joc Pederson. He ripped a double after I said out loud that I haven’t seen him get a hit since ‘Nam it felt like. All in all, a decent weekday at the ballpark. The game wasn’t very interesting to be honest. The weather was miserable in comparison to Los Angeles. But it beats a day at work!